Some people make MLM sponsoring look so simple! The truth is that sponsoring people in network marketing is very simple, it’s just not easy. 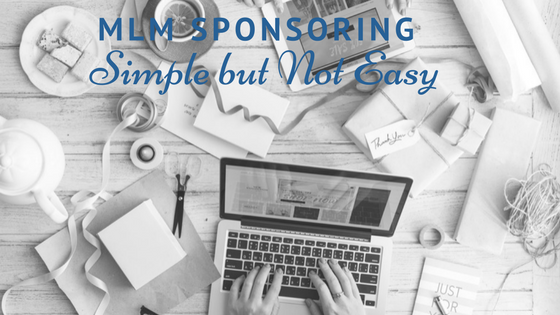 You see, the steps to sponsor people into your business and build an amazing team are simple. The reason it’s hard is because we all overcomplicate things. Not only that, you probably feel a little uncomfortable with some of the steps because you aren’t used to them. Things like talking to people every day and presenting your business or products can be very scary stuff. That is exactly why it’s not easy. 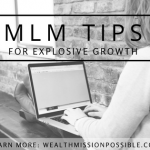 In this post I have some MLM sponsoring steps to help you move past your fears and into success. I get pitched all the time from people who are trying to recruit me into their business. I also get pitched on products. Have you ever been approached by someone who pitches a product and it is the biggest mismatch ever? That is exactly why YOU need to ask questions before pitching anyone on your products or opportunity. This is the simplest MLM sponsoring secret yet. For example, I am extremely fit and at my perfect weight. So when someone comes along and tries to sell me a weight loss drink, I just laugh. If they had bothered to ask me questions first, they would know that I don’t even remotely need a product like that. It’s the same with your opportunity. Starting a business may be the furthest thing from a person’s mind. If you ask them questions, you would find that out and not waste your time. You might make a new friend. Asking questions in MLM sponsoring is all about assessing if this person needs your product or business. The simple way to MLM sponsoring is to ask questions, find out about people and build relationships. Now if someone tells you they are looking to lose weight because they feel awful, that’s your cue to bring up your weight loss drink! Do you love to blab? That won’t work too well in MLM sponsoring. I used to blab so much that I was not able to sponsor a single person. Not only that, it took a lot of time. Nobody has time for that! Instead, use third party tools and let them do the talking for you. Once you establish that a person is interested in the products or business opportunity, point them to a third party tool. Pamplets – only give these to people who have time to read and like paper. CD or DVD – these are great to listen to audio in the car. Link to video – they can watch at their convenience at home. Someone told me that the people they gave third party tools to never called them back. Really? It’s true. They never will. YOU must follow up with each person that you shared your product or opportunity with. There is no other way. In fact, the best way to follow up is to make that appointment when ou give them the third party tool. Get their contact information and nail down a day and time when you both can talk. Don’t skip this step. It’s not always easy to do, but it is pretty simple. It’s not like engineering a rocket. Today I gave you 3 simple tips to help you sponsoring people in MLM. It may not seem easy right now but the more you do it, the easier it will get. As you continuing learning, you will get better and better at this. Then it will become easier! 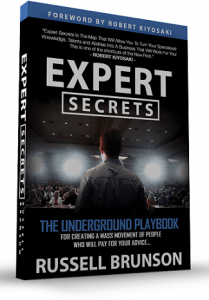 7-Figure MLM Earner reveals how to Recruit Quality Leaders into YOUR MLM business even if you are just getting started.